This sign warns you of a road bump ahead. If they are man-made, these are often called 'traffic calming measures', 'sleeping policemen' or 'judder bars'. Traffic engineers look at engineering, education and enforcement when designing traffic environments. 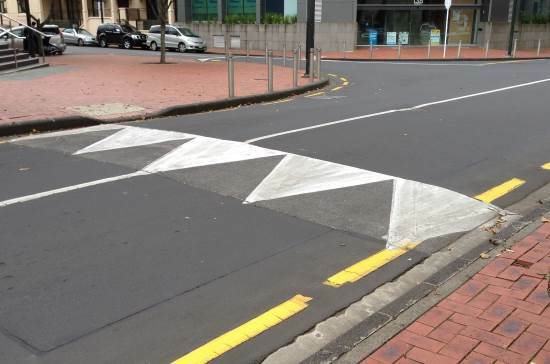 In this article we’ll show you many of the different ways in which traffic engineers make roads safer by using measures to slow drivers down where there might be danger, for example, if there are pedestrians around. 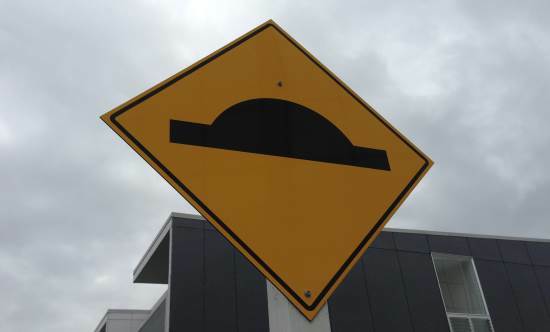 These mainly consist of speed bumps of which there are several kinds. 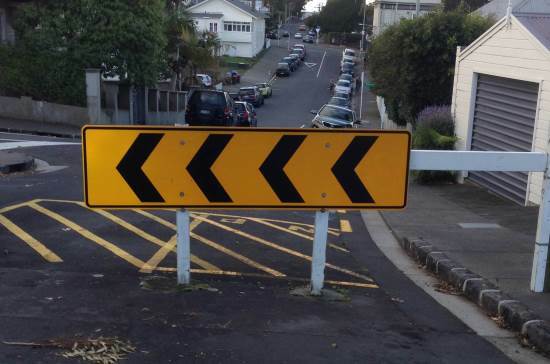 They are usually indicated by a sign such as the one below warning that road humps are ahead. This speed table shows a short rise just before a crossroads and a long elevated part through the crossroads, then back down again. 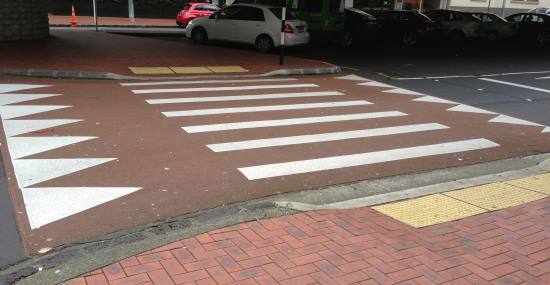 This raised pedestrian crossing acts as a speed table and is situated just before a junction on a one-way street. 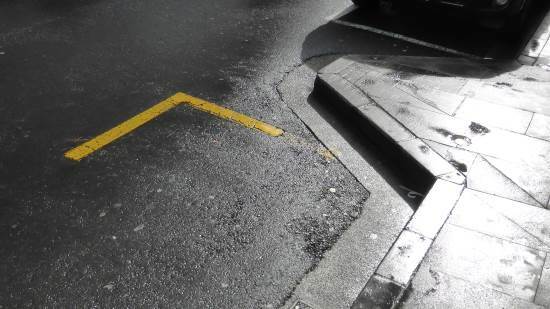 Road cushions are spaced speed bumps that allow wider heavy vehicles and emergency vehicles to pass through the gaps without going over a bump, but cars (which usually have a width of 1.5-1.9m) will have to have at least one wheel going over a speed bump. 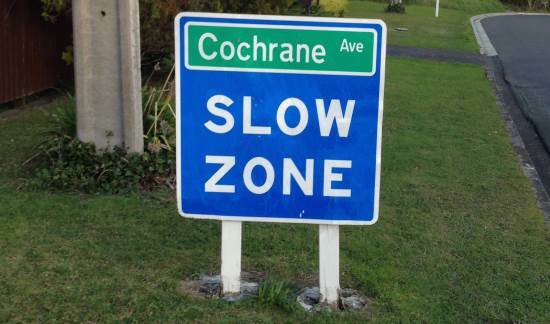 Slow zones warn drivers that conditions may not be suitable for speed. They do not enforce a compulsory speed limit, but drivers are expected to observe a slower driving speed. 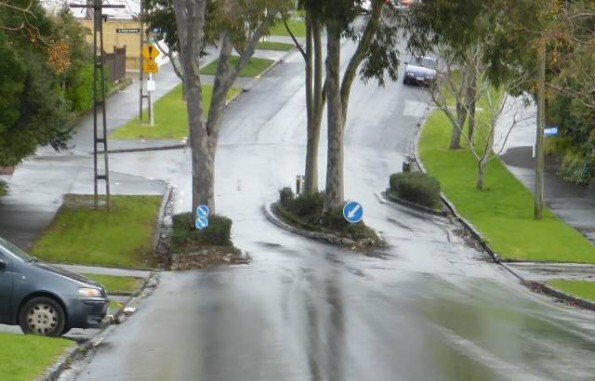 Chicanes force drivers to slow down and pay attention to oncoming traffic. Chokers temporarily narrow the road or restrict parking. They can be short, like this one, or longer and restrict the sense of space in the road for road users. 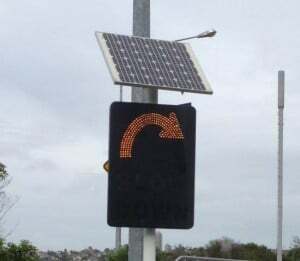 Surface change can also help make road users aware of danger. Sometimes it might provide a different driving feeling, for example a cobblestone-style surface can impart a vibration through the wheels that makes drivers slow down, or it can be more grippy road surfaces such as the red surface seen below on this speed table at an intersection, which is often also seen just before busy pedestrian crossings, especially those on a steeper hill. Roads can be blocked off or diverted to reduce access. The image below shows a road that has been blocked off to form a cul-de-sac. Lanes may be narrowed to make traffic more aware of a hazard. In the photo below the lane on the right (coming towards us) is narrowed by the median strip. 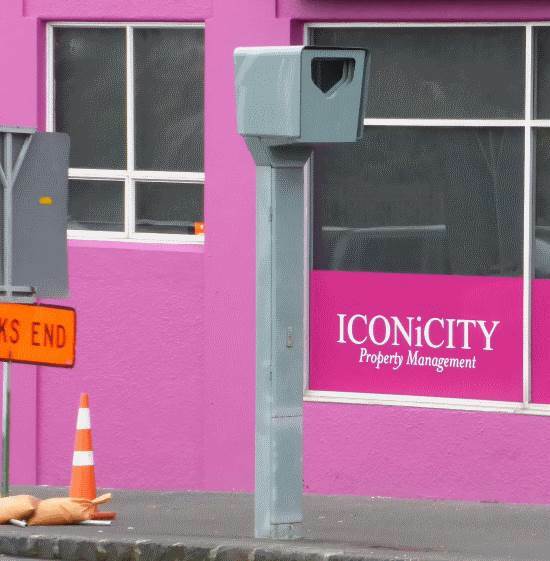 Speed cameras can either be fixed, like the one shown below, or mobile. 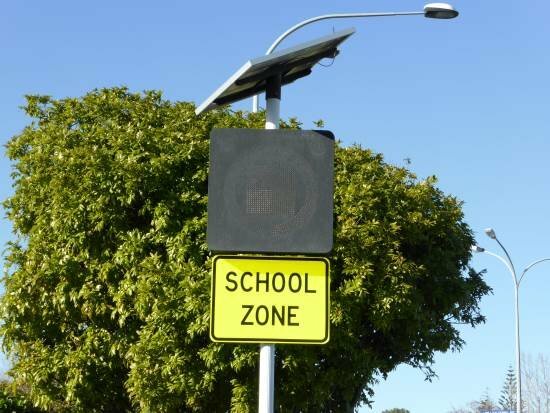 School zones are active around the specific times that children are travelling to and from school. 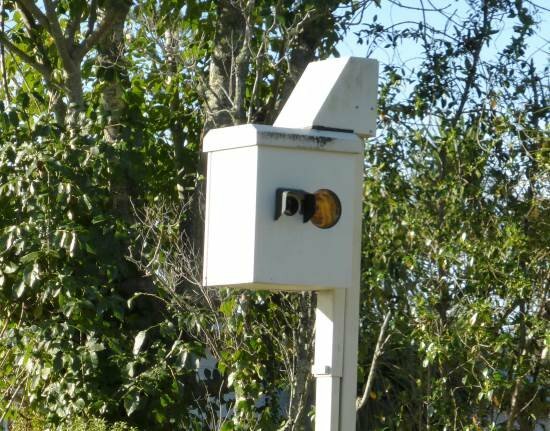 They will flash a restricted speed limit (40kph) when in operation. 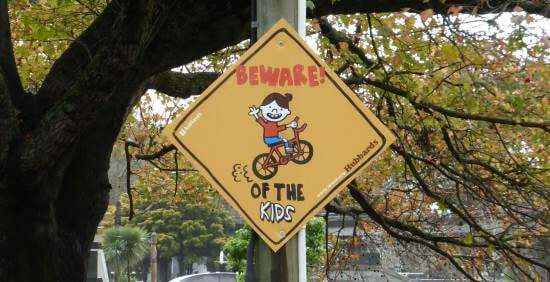 Home-made signs are made where residents feel that certain road users might be at risk, and this ranges from children to baby ducklings. 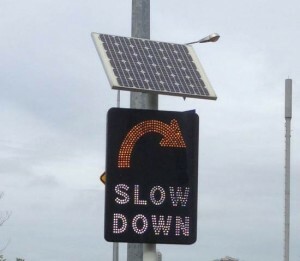 These signs are usually solar-powered and are activated when a vehicle approaches. They can warn of speed, children, a curve, etc. 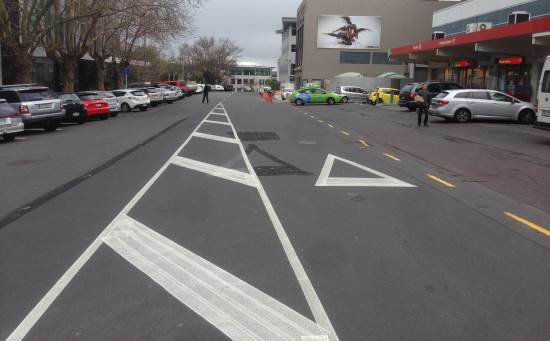 Shared zones are areas where pedestrians have priority, but vehicles can use them, too. The speed limit in a shared zone is 10kph.